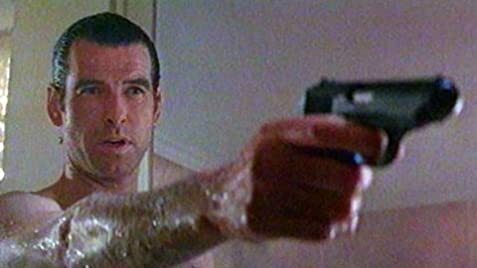 James Bond: Beg your pardon, forgot to knock. Q: Is the satellite dish that Janus uses for his headquarters a real place? Q: Why does Janus want to betray the British government? World security is in danger , ¨Janus¨ , a terrorist organization has robbed the ¨Goldeneye¨ , an ultra secret weapon system -a spy satellite- and menaced to use it for destroying a city if doesn't pay and to cause a sabotage on the global financial markets . MI6 -Judi Dench as M- assigns to James Bond the mission to retrieve it . Of course , there's the usual breathtaking opening scene developed in a chemist arms factory located in Siberia . 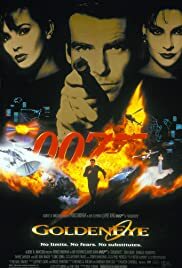 There Bond and agent 006 Alec Trevelyan -Sean Bean- will have to confront against Russian military , but Alec is imprisoned by General Ourumov -Gottfried John- and at the end takes place a deadly confrontation . The film has sensational and spectacularly difficult action set pieces , as the tank pursuit in the city of Saint Petesburg or the taking on the armored train . Action is well shot , , including a groundbreaking and impressive final confrontation developed in Janus headquarter , located in Island Cuba jungle . As always , it appears Q as gadget man who teaches Bond various tools as a bomb pencil that will have special importance posteriorly , besides a speed car -BMW- equipped with rockets launchers . As Bond girls are Famke Janssen as Xena in a sensationalistic and crazed interpretation as the orgasmic to whom all risk is a emotion . Thus , she steals a super-helicopter ¨Tiger¨ and facing off opponents .Izabella Scorupco as Natalya Simanova , a computer specialist , she is marvelous and enticing with a similar countenance to Ingrid Bergman . Plus , it appears unbilled Minnie Driver . Tina Turner sings stunningly the main title and atmospheric score by Eric Serra . The film was finely directed by Martin Campbell . Rating : good and entertaining .